The Japanese didn't think so, they took it in a week. If you've ever been to Siloso Beach, you may have noticed this pillbox nestled amongst the undergrowth, overlooking the various beach bars and beach volleyball courts on the beachfront. It was one of the pillboxes which wasn't demolished (fortunately) in the name of progress. Some heritage enthusiasts applaud the restoration job done to the pillbox, while purists may feel that the camouflage patches are an abomination. Either way, I am just thankful that the developers did not blast the pillbox to kingdom come when they were handed the gargantuan task of transforming the island into a recreational destination back in the seventies. Siloso Beach, or should I say Sentosa as a whole, had changed so much since the Nineties, which was around the time that I first set foot on this "magical" island. In the early Nineties, the only way to get to the island was either by ferry or cable car. The main ferry terminal on Sentosa itself was an icon of the island, as was the symbolic cable car or monorail. Buses were also not a travel option as the Sentosa causeway wasn't built until late 1992. Attractions such as The Enchanted Grove of Tembusu, Fantasy Island, Asian Village (which we explored after it's closure here), Volcanoland, the Musical Fountain and even the iconic A&W Riverboat - technically more of a restaurant than an attraction, were the main draw of the day - ironically none of which remain in the present day. There was no Universal Studios, Sentosa Luge, Megazip, Wavehouse and most certainly no casino. Nonetheless, people of all ages were still flocking to Sentosa for an enjoyable day out. The Siloso Beach of the Nineties which I remember was a placid white sandy beach with calm waters. There was a channel where one could swim with little difficulty between Siloso Beach and the three man-made breakwater islands, which protected the reclaimed beach against longshore drift or, in simpler terms, erosion. A far cry from the boisterous cheer around the various beachfront shops, cafes and volleyball sand courts lining Siloso Beach today, the Siloso Beach of yesteryear was a true blue beach meant for simpler pleasures such as sunbathing or wading. I was at Sentosa with my kid over the weekend and thought that it may be a good idea for me to visit the "camouflaged" pillbox along Siloso Beach to take some photographs. Many of the attractions I have known from my younger years may be long gone, but this pillbox has definitely withstood the test of time. For the record, pillboxes are small concrete fortified structures built by our British predecessors and used as placements for machine guns. They are named as such due to their perceived appearance to the cylindrical boxes in which medicinal pills were once sold. The thick concrete walls of these pillboxes help protect British soldiers from enemy small arms fire and grenades while the loopholes allow the defending forces to aim and fire their machine guns. Characteristically built along our eastern and southern coastlines in the belief that the Japanese would attack from these directions, these unassailable structures were positioned at strategic intervals to provide offensive fire. Suffice to say, they were an integral part of the British Army's defence strategy during WWII although they were never utilised as the Imperial Japanese Army came blazing in from the North on their bicycles instead. With Japan's tough militaristic attitude and aggression in the years leading up to WWII, Singapore's peace was in danger of being compromised. The Japanese, under the rule of Emperor Hirohito, had become an empire, a modern nation hungry for more land and more control in East Asia. It wanted access to more natural resources and turned to war to expand its wealth and living space. In 1937, Japan started by invading and retaining part of China. With the abundance of natural resources like rubber in the Malayan peninsula, as well as the strategic location of Singapore, the British knew that the region would soon be under threat. A defence plan was formulated in preparation of armed conflict with the advancing Japanese forces. The pillbox at Siloso beach was one of several built during 1936 -1940 as part of Singapore’s overall defence. There were pillboxes erected at intervals of 550 metres along the Sentosa coastline to ensure a continuous, overlapping arc of fire. These pillboxes were part of a much more elaborate defence system on Sentosa Island (then known as Pulau Belakang Mati, or the Island of Death from Behind) comprising of Fort Serapong, Fort Connaught, Mount Imbiah Battery and Fort Siloso, the latter of which has been restored into a full fledged tourist attraction complete with wax figures reenacting scenes from WWII. Although these pillboxes were manned and operational during the Japanese invasion, the expected siege of Singapore from the South never happened. *For more info on these forts and batteries, as well as Singapore's overall defence plan during WWII, we would like to recommend Peter Stubbs's website (www.fortsiloso.com) It is a real treasure trove of rare photographs and detailed, accurate information and I trust that you will spend many enjoyable hours going through his site. This pillbox, along with all the rest of the pillboxes scattered along the coastline, was equipped with 2 Vickers machine guns, a water-cooled 7.7 mm calibre machine gun produced for and widely used by the British Army, a small searchlight, handy for swiveling around to project bright beams on suspicious crafts approaching from the south under the cover of darkness, and a generator, which was used to power the searchlight. When the gunner fires the weapon, another man - the loader - would sit to the gunner's right and feed in belts of cloth, into which the rounds had been placed. The weapon would draw in the belt, pull each round out of the belt and into the chamber, fire it, and then drop the brass cartridge out of the bottom, while the cloth belt would continue through to the left side and wind up on the ground. The expanded cartridges would also gather in a pile underneath the weapon. The weapon had a great reputation for excellent performance and reliability. A narrative in a defence publication tells of an incident that took place in 1916, during which the British Army's 100th Company of the Machine Gun Corps (MGC) fired their ten Vickers guns continuously for twelve hours. Using 100 new barrels, they fired a million rounds without a single breakdown. As the Vickers machine gun was a water-cooled weapon, it relied solely on its water jacket to bring heat away from the barrel, which would heat up substantially during firing. The water jacket would be filled with water around the barrel and conducted heat would then boil the water in the jacket. The steam would be carried away down a rubber pipe, to condense in a metal can. At intervals, the condensed water could then be poured back into the jacket to top it up. Another tactical function of the condenser tin was to hide the steam which emitted from the weapon during its firing which may give away the gun's position. This cooling system made the weapon much heavier than others, but it was very effective and enabled the gun to keep firing continuously far longer than other air-cooled weapons. 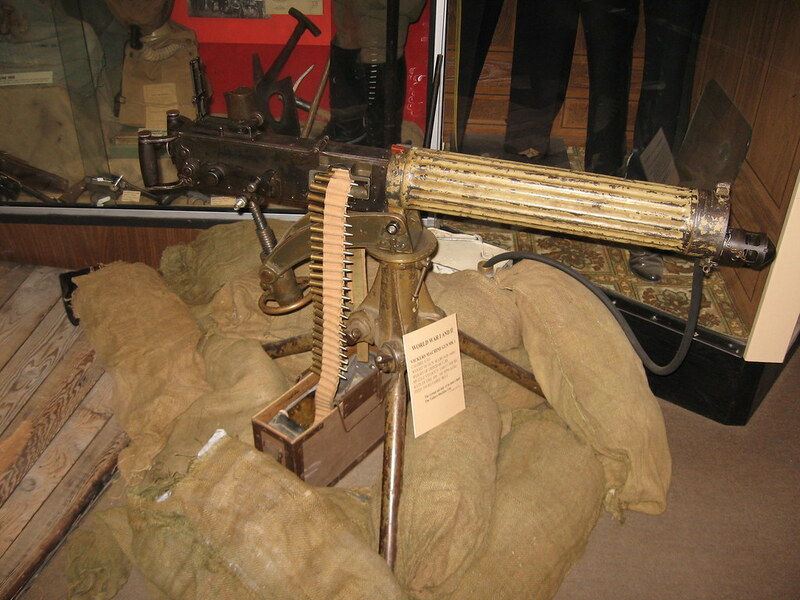 A restored Vickers Machine Gun, with the ammunition cloth belt loaded. as well as the black rubber pipe which leads to the condensor. Looking at the design of this particular pillbox, I would guess that the upper portion would be where the searchlight would be, hence the larger loophole. The significantly smaller lower loopholes on the lower portion seem just right for the barrel of a Vickers machine gun to protrude out. It isn't hard to imagine the searchlight team using the large light beam to illuminate enemy units at night while the gunner takes aim and lets fly with a flurry of rounds. Apart from using the machine gun to fire at specific targets, the British also utilised their Vickers machine guns to provide indirect fire (i.e firing at targets which cannot be seen). Indirect fire is most commonly used by the Artillery to strike targets many kilometres away with the aid of an inclinometer to understand the folds of terrain and the effect of gravity. In similar fashion, machine gun fire can also be used to hit targets out of sight by being fired at a slightly higher angle and using gravity to "bend" the shots downward with the help of an inclinometer. From what I could make out from peeking inside the lower loophole, I could see that there was a metal ladder leading up to the upper chamber, and beyond that, a small subterranean chamber. This was probably where the extra rounds of ammunition were safely stored out of harm's way, ever ready to be expanded upon enemy confrontation, and possibly leading to where the pillbox entrance is. Update: You can see a photo taken from the upper chamber here, which was uploaded by a member of the global treasure hunt game, Geocaching. The photo shows the view through the loophole of the upper chamber, and clearly shows the metal rugs of the ladder leading down to the lower chamber, and the small subterranean chamber beyond that. 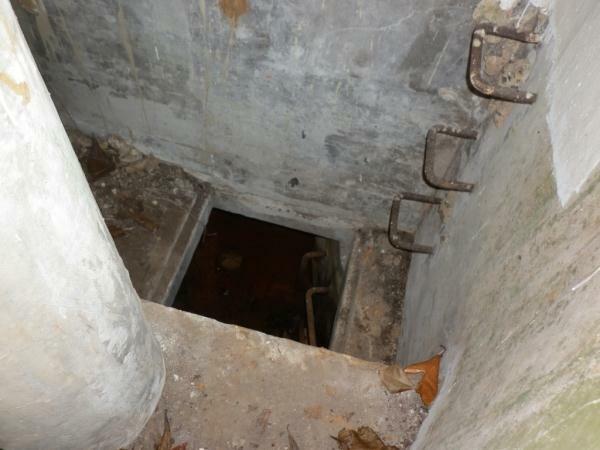 There is also a photo of the subterranean chamber here. 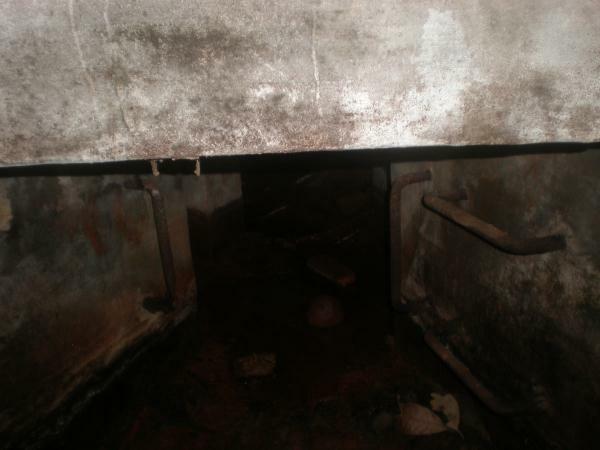 The lower chamber beneath the pillbox. Note the ladder which leads to the upper chamber on the right. I am interested to find out more about this pillbox and, as always, I would love to hear your stories if you have any that surround this peculiar structure along Siloso Beach. I hope that the pillbox will remain preserved for many more years to come, and that our future generations do not take our peace and political stability for granted. Please do send us an e-mail if you have any information to share on this topic.